When the Flintstones finally got new neighbors in “that creepy old Tombstone Manor” next door, little did they realize that it would be the Gruesomes! 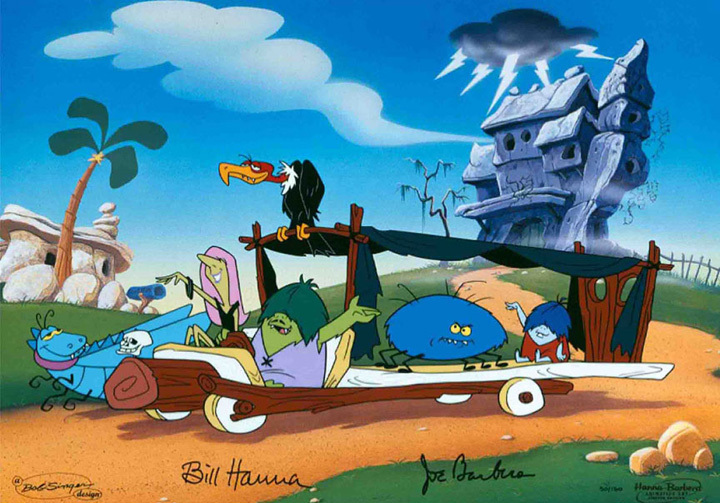 In this hand-painted limited edition cel, Wierdly, his wife Creepella, and son Gobby (“it’s short for Goblin”)are out for a drive in their prehistoric hearse, accompanied by such, well, gruesome accoutrements as a lightening-laden storm cloud that follows the brood wherever they go, Schneider the Spider, a giant grasshopper and (of course) a vulture. Back in tombstone Manor, a visitor, or in the case of Fred and Barney, a Gobby-Sitter, might find a man-eating flower (“it’s a Tiger Lilly!”), “Occy” the Sabre-Toothed Octopus, a talking-head-in-the-box, and alligators in the basement, all of which give Fred bats-in-the-belfry. Determined to move the family away from these “oddball neighbors,” Fred quickly changes his mind upon learning that his gruesome new neighbors are the stars of the television show, “At Home With The Gruesomes.” Needless to say, Fred would be a natural for their show! If you doubt it, just ask him! Each Meet The Gruesomes cel is signed by the Studio co-founders William Hanna and Joseph Barbera.